#464 Water feature. 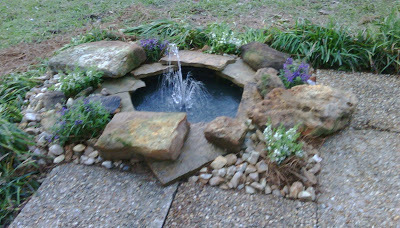 – Laurel Mercantile Co.
Now reading: #464 Water feature. I was responsible for choosing the little flowers around it and that’s about the only thing I contributed. Ben and Daddy were filthy, covered in dirt and sweat after hauling in dirt and laying pavers to make the patio area, digging holes and planting money grass—the kind of dirty that will take at least 2 showers to remove every trace of. This picture’s not great, but I’ll be sure to post more soon.